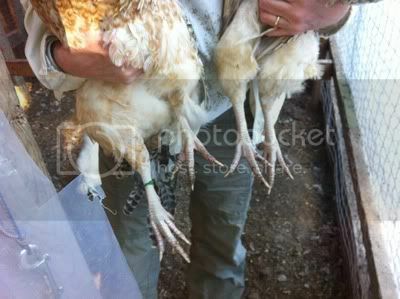 Euskal Oiloa Chicken Forum / Blue legs or not? » Blue legs or not? I am still unsure whether one of my roos has blue legs. What do you guys think? Re: Blue legs or not? Most alleles at the Id locus are apparently slow to be expressed; how old are your roos? They are almost 7 mths old, hatched mid Sept. I'm having a really hard time deciding Monika. It's hard for me to tell in that light. I think I see blue in the one on the left. Could you take a pic outside in the sunshine? I agree with Susan it is hard to see. It almost looks like the 2 outside legs look bluer, one on each bird Usually the blue is pretty blue or grey. And the white looks pink. That's what I thought Claire! I'm glad I'm not the only one having trouble with seeing the colours right. 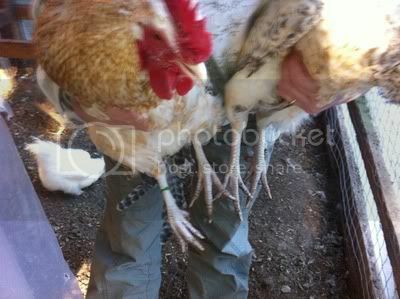 Ever since I made the comment about the roosters legs being blue and went back to look at the pictures of him I have been thinking are they really blue or are they white? I have right now some chicks that are almost 3 weeks old that have yellow skin but it appears that there is some blue shining through at their hawks. Might be getting some willow legged off springs form my bigboy too? At least he has yellow skinned offspring. I will take a new picture tomorrow in the sunlight and hopefully that will help. Thanks so much for having a look and giving me your opinions. I would really like to start my breeding program with the best possible roo. On a barred roo the blue should be masked. I have found that sometimes you can see a bit of green (on those with yellow legs) or blue (on those with white legs) but it can disappear as they get older. On a roo with only one allele for barring the blue may stay. Even on the pullets I have found the blue and green are easiest to see when they are half grown and then fads so I wonder if it was ever really there.